#2: Use a bilingual contract and purchase order (PO). This Chinese lawyer explains why. #3: Make sure the name on the supplier’s bank account matches their business license and contract. If these items are not the same, you will have little recourse in the event the supplier underperforms and you need to go to court. 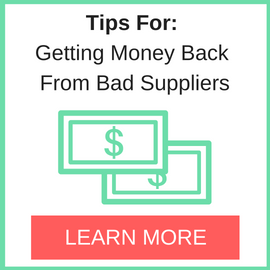 #4: Don’t release payment until an independent 3rd party as check the quality of goods before they ship out. 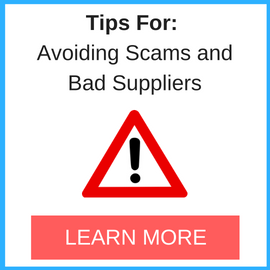 #5: If the deal is too good to be true, it is probably a scam. You just can’t buy authentic brands (like Apple or Gucci) direct from “the factory”! Red Flag Assessment for Scams! Legal Disclaimer: SupplierBlacklist.com (SBL) offers this list of service providers in hopes of putting you in touch with affordable and effective options for help. SBL does not provide services nor represent the service providers listed on this page. SBL, its staff (including volunteers) and associated companies, disclaims all liability for any loss or damage arising out of or in any way related to the introductions made to 3rd party service providers.